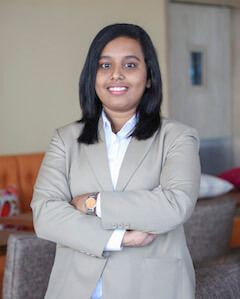 Graduating from Rajiv Gandhi University of Health Sciences, Karnataka, Dr. Grace boasts a wealth of education and experience in Naturopathic Medicine and Yogic Sciences. Over the years Grace has attained an abundance of unique and specialized skills in acupuncture, acupressure, reflexology, hydrotherapy, mud therapy, chromo and magneto therapy, physiotherapy and Oriental/Ayurvedic medicine. Hardworking and ambitious, Grace has also attained a number of outstanding achievements during her education such as JINDAL GOLD MEDAL for meritorious student of the year and Rank holder in Rajiv Gandhi University of Health Sciences. Dr. Grace is extremely excited to join The Retreat Palm Dubai, the first holistic wellbeing resort in the UAE.